Our product range includes a wide range of ss 304 channel, ss 304l channel, ss 316 channel, ss 316l channel, ss 321 channel and ss 310 channel. 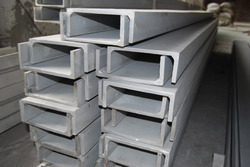 With rich industry experience and knowledge, we are offering a qualitative range of SS Channel that is broadly utilized in the construction, automobile industry and railways. This channel is manufactured using high grade stainless steel at vendors’ end. Reckoned for its sturdy nature, this channel is made available in various grades and other allied specifications. Apart from this, our offered variety is available in the market at reasonable prices. With rich industry experience and knowledge, we are offering a qualitative range of SS Channelthat is broadly utilized in the construction, automobile industry and railways. This channel is manufactured using high grade stainless steel at vendors’ end. Reckoned for its sturdy nature, this channel is made available in various grades and other allied specifications. Apart from this, our offered variety is available in the market at reasonable prices.